…..news letter #539 – sand, stain, lacquer…..
why does it feel like friday when not much has come in this week, although there are some new things in, most of this stuff is showing up tomorrow. oh, i should mention that they seem to be doing some work in the parking lot today and i assume tomorrow, so you may need to park out front, or on the end of the block, depending on the time of day…. – this killer soundtrack is now available on my buddy joe’s label…. 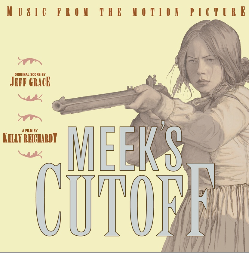 “kelly riechardt has directed several films, an old joy, wendy and lucy, and last year saw the release of meek’s cutoff. a slow burning, bleak film following a small group of settlers traveling across the oregon high desert with their guide stephen meek. what follows is increased paranoia and tension as they start to believe meek does not the territory he has lead the group in to. the film was released to some fantastic reviews and michelle williams recently won the hollywood film festival award for best actress for meek’s cutoff, my week with marilyn and take this waltz. this fantastic film’s score was written by jeff grace. grace has scored several films including ti west’s excellent retro horror ‘house of the devil’ and jim mickles great vampire movie ‘stake land’, as well as working as an assistant to howard shore’s score for peter jackson’s ‘the lord of the rings’ trilogy. grace’s soundtrack work is always interesting and defies genre. for meek’s cutoff, grace enhanced the films portrayal of the fear of the unknown stark land the group faces. the sounds composed by jeff grace are hypnotic, ambient and minimal, much like the deserted dust lands the characters in the film travel through. the soundtrack blends classical composition with drone and experimental avant garde music. meek’s cutoff was one of my favourite soundtracks and films of 2011, and i’m honoured to present it here on 10″ virgin vinyl, in a gorgeous sleeve, including a small insert of liner notes and photographs of the film.” stark and haunting. – in tomorrow… erased tapes label mates olafur arnalds and nils frahm record and mix their new collaborative record between reyjkjavík and berlin as a surprise release for label founder robert raths. “stare” is a true family effort, with anne müller joining in on cello. this limited edition vinyl-only includes a download code for an 11-track erased tapes 5th anniversary collection. – originally solicited as a 2012 record store day release but withdrawn due to delays. before retiring, captain beefheart toured north america one last time in late 1980 and early 1981, and it was during this final tour that the radio broadcast presented here was made. included on the final week of the tour, beefheart and band played two dates in canada, on 16th and 17th january 1981, at the commodore ballroom in vancouver. bonus tracks are from a 1971 detroit tv broadcast and a 1980 saturday night live performance. – debut collaborative release from manuel padding and steve gunn (ghq). steve plays guitar with effects and manuel is on electronics, vocals and percussion. dune church comprises of two tracks, the first with some beautiful playing from steve, but layered with manuel’s electronics, which fluctuate between psychedelic hazes to almost concrete walls of heavy drones at noises at times, it creates something otherworldly. the b side, has rapid cascading plucking merged with whirring electronics, steve’s playing moves in and out of the blissed out mystic drones already laid down by the duo, haunting vocals creeping in and out. – originally solicited as a 2012 record sore day release but withdrawn due to delays. 1988 was notable in the career of leonard cohen for a number of reasons. not only was he was still reeling from the rejuvenation of his career, largely as a result of jennifer warnes’ cohen covers album from the previous year, but his own, second album of the decade was finally released. but generally considered to be the finest recording of the tour transmitted across the airwaves was from toronto’s massey hall on 9th november. – in tomorrow… heavy on the funk, with the urgency of hip-hop never far away — from this prime era member of sun ra’s arkestra and the super funky brass ensemble formed by 8 of his children. this is music that plumbs the depths and rings with joy. – in tomorrow…. the third album from swedish trio fire! — something of a supergroup with members from already well-known projects. with their heavy, hypnotic, psychedelic rock’n’jazz explorations, they have carved out a different sound than any of the groups they are normally associated with. – in tomorrow… a vinyl-only release documenting live performances by alan lamb, garry bradbury, david burraston, oren ambarchi and robin fox. held outdoors during the evening of october 31st at the wired lab, in rural south west, new south wales, australia, this 2lp is a document of the event; the result of an artist-in-residence program to explore the sonic possibilities of the wires, landscape scale installations in rural nsw, a distinctly australian invention that was pioneered by australian artist alan lamb since the 1970s. – in tomorrow… a film by robert millis. folk cinema from the eternal never-ending collage that is india. a journey through the ancient southern indian state of tamil nadu featuring hindu trance ceremonies, street music, festivals, nagaswaram improvisations, impossibly loud cities, ancient temples, processions, devotions, decay, fireworks, abstractions and more. india is impossible to know: it is impossibly old and impossibly new, impossibly rich and impossibly poor, quiet and chaotic. offered here is one perspective, raw, captured live and in the moment, with an emphasis on india’s complex and mesmerizing sounds. – the long awaited remastered mbv by kevin shields…. now if only they’d press vinyl. – three new releases, all on oddball formats, from one of our favorite groups. all ultra limited and way out of print already. – in tomorrow… kathryn bint’s tender vocals still send husky shivers down the spine, but into the trees is so much more than beautiful folk songs. produced by kieran hebden (four tet), into the trees weaves a fabric of different sounds, united by bint’s elegiac voice and strong storytelling. radiohead’s colin greenwood lends the album his bass powers. – in tomorrow… recollection grm is one more label within the editions mego family of labels. its aim is to make available on vinyl the vast archives of groupe de recherches musicales (grm). being released in batches of two every three months, it will present both known and lesser-known works. some of these pioneering works have been out-of-print in this format for over 30 years, and would be a valuable addition to any serious collection of electronic music. it is worth pointing out that this series is neither a re-run of the original collection ina-grm series or the phillips prospective 21e siècle series, but something new altogether. this is pierre schaeffer’s le trièdre fertile, full version 1975-1976, with the participation of bernard dürr. this trihedron, schaeffer’s last piece, echoes the physicists “reference trihedron,” linked to the three fundamental measurements of sound: frequency, duration and intensity. the basic signs of traditional sol-fa that enable the transcribing of pitches, rhythms and nuances also correspond to these three measurements. however, it is precisely outside or beyond these parameters that, all through his life, schaeffer researched music. hence, qualifying this trihedron as “fertile” is the confession “of a late repentance.” on the other hand, and against all odds, this piece was only composed from synthetic sounds, developed by bernard dürr. it is pierre schaeffer’s only purely electronic music work. here, the synthesizer is rather monitored by sensitivity than by computation principles, thus letting uncanny structures emerge. – the new album from this icelandic ambient pop outfit. i don’t really need to explain this one do i? – nor do i need to explain the last of these smiths reissues, do i? – in tomorrow… wild dog is susanna’s eighth album, that is effectively one album a year of quality releases since her debut in 2004, indeed, a very rare treat these days. possibly best-known for her unique and striking interpretations of iconic songs like “jolene,” “hallelujah” and “love will tear us apart,” she has also proven herself as an original songwriter with a strong signature. the ten originals on wild dog are darker, wilder and more intensely seductive than ever. susanna has assembled some prominent guests on the album with emmett kelly from bonnie “prince” billy’s band and jeremy gara from arcade fire appearing on all ten tracks. – in tomorrow… originally released on cd in 1996. recorded and compiled by tucker martine in 1994, the bulk of this album features the magnificent results of a chance meeting between martine and the late, great master of gnawa music, maâllem boubker ghania (1927-2000), who kindly offered to organize a several-day informal recording session in his home. these spectacular recordings from essaouira morocco are interwoven here with other encounters, including a wedding procession in the streets of marrakech, snake charmers of the jemma el fna with their rhaitas, calls to prayer with children playing while james brown echoed off of the labyrinthian walls, moroccan radio dial surfing and more.